Subject: Extension of retention of General Pool Residential Accommodation (GPRA) to the officers and staff Of CPWD on posting to Border works projects in Rajasthan, Punjab, Gujarat and J&K at Indo-Pakistan Border, in Uttarakhand and Sikkim at Indo-China Border, Indo- Bangladesh Border and Indo-Myanmar Border for the period upto 31.3.2022. I. Officers and staff of CPWD posted in Rajasthan, Punjab, Gujarat and J&K at Indo-Pakistan Border and in Uttarakhand at Indo-China Border. ll. Officers and staff Of CPWD posted in Sikkim at Indo-China Border, Indo-Bangladesh Border and Indo-Myanmar Border. (i) The allottees. who are in possession of entitled type of accommodation, shall be eligible for retention on payment Of double the normal licence fee or opt for allotment of accommodation one type below their entitlement on payment Of one and half times of the normal licence fee. The allottees, who are already in possession of accommodation one type below their entitlement, shall be eligible to retain the same accommodation on payment of one and half times of the normal licence fee. Such retention shall be admissible beyond the period of retention permissible under Rule 40 Of the Central Government General Pool Residential Accommodation Rules, 2017. (ii) The entitlement of such allottees will be determined as per their pay level in the pay matrix as on the crucial date on which he/she has been posted to the aforesaid area. 3.The above concession has been extended keeping in view the fact that these projects are time bound and of national importance being carried out in difficult and risky areas. 4. This issues with the approval of Hon’ble Minister Of Housing and Urban Affairs. 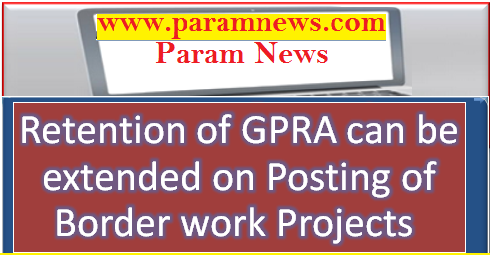 Extension of retention of General Pool Residential Accommodation (GPRA) to the officers and staff Of CPWD on posting to Border works projects in Rajasthan, Punjab, Gujarat and J&K at Indo-Pakistan Border, in Uttarakhand and Sikkim at Indo-China Border, Indo- Bangladesh Border and Indo-Myanmar Border for the period upto 31.3.2022.